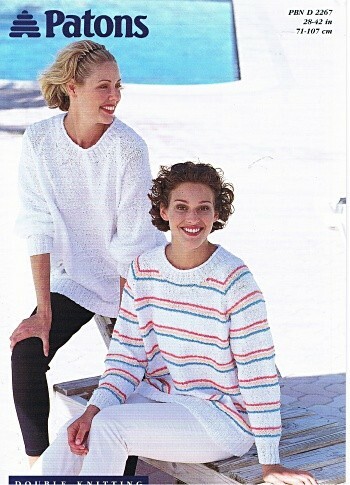 Hand knitting pattern for a round neck sweater knitted in stocking stitch and garter stitch stripes, either in one colour or multi coloured. Patons Leila DK, or any double knitting yarn. Jigsawknits sells: Knitting Patterns for Men, Women, Babies and Children - Knitware Design Software - Knitting Magazines - Buttons - Knitting Accessories. A fast and friendly service with just £1.00 postage and packing charges to the UK.